Our first visit to The Mulberry River in Ozark, Arkansas this weekend was a blast! Just a couple hours down I-40, the Mulberry River offers a fun ride with constant current and loads of fairly easy rapids. In fact, the Mulberry offers about 40 miles of great canoe & kayaking water. This river is rainfall driven, so you must plan your trip carefully. Too much water makes it very dangerous and too little water means dragging your kayak through the shallows. Visit the Turner Bend website for a daily updated gauge of the current river level. They will even sell you a detailed river map and canoe guide with all of the named rapids listed. Since Dianne and I arrived at Turner Bend late in the afternoon, we took the short four mile float trip from the public access at Redding Campground in The Ozark National Forest down to the Turner Bend take-out at the Highway 23 bridge. The Mulberry River level was at 2.05 feet according to the Turner Bend gauge. The river level was perfect for a couple of recreational kayakers like us. As you can see from the picture on the right, the Mulberry provides lots of chances to test how cold the water is! The nice folks at Turner Bend shuttled both of our kayaks for a mere $16. I am eager to return and paddle more of this thrilling river. Kayakers had better snap on the sprayskirt for paddling the Mulberry River. Although it is not as rocky as the LMF, there are loads of ripples and standing waves that make it difficult to see the rocks that are there. There are many more rapids on the Mulberry River than the Lower Mt. Fork River. Rather than the typical pool & drop, the Mulberry River water descends at a consistently swift pace through rapid after rapid. Since we launched so late in the day, we had the river practically to ourselves. This was surprising because the Turner Bend store where we arranged the shuttle was absolutely packed with bikers! Turner Bend is located where the river crosses Highway 23. This is part of 'The Pig Trail', a scenic roadway popular with motorcycle clubs and car clubs. The Pig Trail and the National Forest campgrounds bring folks from all over the country to this beautiful part of the Arkansas Ozarks. One of the best features of this river is the great put-in and take-out spots. Our put-in at Redding Campground was large and made with tons of lovely native stonework. With so many riffles and S-curves to paddle on the Mulberry, it is easy to lose track of time. Thankfully, Turner Bend has a take-out that you simply cannot miss. One highlight of our Turner Bend visit was seeing the electric boat lift they use to bring canoes & kayaks out of the water. For me, it was love at first sight! While you are there, check out the town of Altus, Arkansas, home of several local wineries & vineyards, just 20 minutes away! If you don't have time to visit the wineries in person, just grab a few bottles of Arkansas wine at the Turner Bend store! It looks like we have perfect paddling conditions on tap for this weekend. 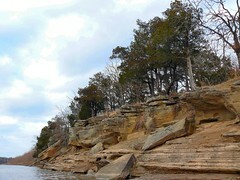 Recent rains have nice river levels flowing on a number of popular Ozark area kayaking locations. The Upper Mountain Fork River - Watch out for the six foot waterfall. All of the above rivers are running strong and the Oklahoma weather forecast is calling for nothing but sunshine. I've got a load of work to do this weekend, but I still hope to slip off somewhere to enjoy some shady water. This weekend, Oklahoma was blessed with lower than normal temps under clear, sunny skies. That kind of weather is not to be ignored! Dianne and I decided to make a day trip to the Ozarks to kayak some clear, cold moving water. For day trips, Dianne and I keep it to four hours away or less. Eight hours of total driving in a single day should be plenty for any non-professional driver. Typically, this means the Lower Mt. Fork River in Broken Bow, but the levels on it have really been fluctuating this year. We decided to visit an old friend, the Elk River in Missouri for some late summer kayaking fun. We were NOT disappointed. Unlike the lower Mt. Fork River, the Elk River from Pineville MO to Noel, MO drops gently but consistently. 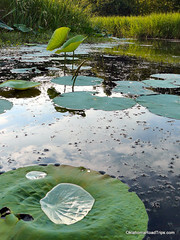 The water moves faster over the shallower areas making paddle-work nearly optional. This makes it popular with rafter during Summer Vacation. Hitting the Elk River on this Sunday morning in August, we were surprised to see more canoes than kayaks or rafts. 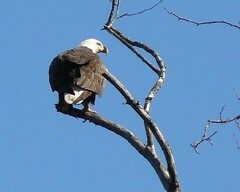 Dianne enjoyed the river much more with the lighter traffic and more family friendly atmosphere. The eight hours of driving...not so much. Next time, we might seek lodging in Jane, MO. There are loads of outfitters on the Elk River in Missouri and the river flow is so consistent that folks float it all year long. Visit the Elk River on a Saturday during summer vacation to see hundreds of other crafts on the water. From church group outings to bachelor parties everyone is out enjoying the summer on the Elk River. We put-in at Big Elk Camp & Canoe, right off Highway 71. They charged us $30 to shuttle us and our boats back to our truck from the Shady Beach Campground at Mt. Shira, Missouri. Many outfitters won't shuttle private boats, so plan carefully and call before you drive. With so many outfitters in Pineville and Noel, you are sure to find someone to take your money. I usually end up spending more on t-shirts and other mementos than shuttling. This time, it was close. Since I have never gotten a decent restaurant recommendation from an outfitter in Noel or Pineville (strange phenomenon peculiar to the Elk River), Dianne and I drove around in desperation seeking Sunday lunch... at 2pm when we got off the water. Right next to River Rat Pizza in Noel (they were closed), we found Rosa's Mexican Store and restaurant. The window said "Buffet, All Day, Everyday"... and the congregation shouted: "Amen!" Rosa's had the best buffet I've tried in ages and a cool little ethnic food market right next door! They make wonderful breads and pastries at the market! Yakker didn't make this trip, so I wasn't able to test self-shuttling options in the area. Someday, when I have more time in the area, I would like to make a list of the public use areas on the Elk River. It is truly a great river for recreational paddling. Until then, consult this map for public access points on the Elk River: Elk River area map. I don't believe I have ever seen so many baby fish swimming around my kayak as I did this weekend. As Dianne said: “the water is so clear you can read the labels of the countless beer cans that litter the bottom of the Elk River”. A small fortune in aluminum cans awaits someone in 'The Canoe Capital of the Ozarks'. Other than that it was lovely. I'll bet I saw 20 soft shelled leather back turtles. It was so cool watching them swim through the crystal clear water. It may not be challenging whitewater, but it moves along nicely through a very scenic portion of the Missouri Ozarks. According to our outfitter, the water levels on Big Sugar and Indian Creek were too low, but we might be able to catch some deeper water this fall. From Tulsa, you can head up north on I-44 for about an hour, then east on US 60 and finally south down Highway 71 to reach Pineville, MO. However, there are scores of routes to get to the Elk River including many slower routes popular with bikers. Don’t miss the town of Noel, Missouri…the highways there are bordered by really scenic bluffs! I can't wait to see the area when the fall colors set in, it really isn't very piney, so there should be quite a change. I slipped out onto Salt Creek of Okmulgee Lake to enjoy an unexpectedly cool and cloudy late Summer morning. It turned out to be time well invested. Launch your kayaks somewhere this weekend, my friends! The weather is too sweet to waste. I saw several of the Oklahoma Flatwater Paddlers were out to enjoy Salt Creek this morning as well. The light was very interesting on the creek today. Speaking of the OFP, I hear Al is striking deep into Missouri territory to paddle this weekend, we couldn't join him, but I think we may try to make a quick run to Pineville, MO on Sunday. The Elk River in Pineville is too close to Oklahoma to be ignored. 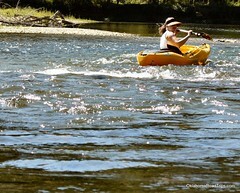 A fun bit of moving water with gravel banks, the Elk River should be on your annual schedule for recreational kayaking. Yakker even suggested he might be able to join us! It is great to be able to link up with friends for kayaking, but if you want to paddle early in the morning...you are likely to be paddling alone quite a bit. When I am kayaking alone, I like to stick to safer-than-usual waters. My wife sleeps better when I am not out risking life and limb. The Salt Creek channel into Okmulgee Lake offers four seasons of shady, sheltered, quiet, Oklahoma flatwater that rarely disappoints me with its beauty. Try not to kill your vehicle on the access road. It is very rough, so take it real slow and leave your lowrider in the garage for this trip! Salt Creek is low, but the Deep Fork River, the Arkansas River and The North Canadian River are rolling pretty fast in our area. I have to get rolling myself, Dianne wants to head to Tulsa and visit her favorite new restaurant for Philippine cuisine. If I play my cards right, I might be able to get in some bowling! We stayed close to home this Memorial Day Weekend, but still managed to squeeze in a little bit of paddling between the Oklahoma monsoons. Saturday, we linked up with a couple friends and paddled around the marina at Lake Eufaula. We had to wait until fairly late in the afternoon for the rain to stop, but eventually it did stop. Eufaula was bustling with boats and every variety of wake sport enthusiast. I enjoyed the easy launch from the boat ramp and getting to check out Greg's new Dagger Edisto kayak. After sleeping in on Sunday, we decided to do some family style paddling in Henryetta, Oklahoma. Jim Hall Lake is the reservoir lake just southeast of Henryetta. It was not crowded with campers, like the Lake Eufaula marina area we visited yesterday. We saw only a few groups of tent campers and two other boats on the lake. Once again, we successfully dodged the rain showers. Dianne was paddling her new Vapor 12 kayak, we put Dylan in my old Perception Swifty and I paddled the Heritage Angler kayak. I always enjoy taking pictures of Dianne and Dylan paddling around in the sunset. Now that we have three kayaks, I hope we can spend more time together on the water this summer. Jim Hall Lake is an easy-to-find spot for picnics, flatwater paddling, fishing and sunset chasing. We will surely be back. I hope many of you got out on the local lakes and rivers for some winter paddling during the recent warm spell. It is snowing at my house today, but I'm willing to bet there are going to be a few more 60+ degree days before Spring arrives. Taking advantage of Oklahoma's occasionally warm winter days are one of the best advantages that come from buying a kayak or living near an outfitter. I recently got out on the Deep Fork River for paddling with my friend Yakker, from Checotah. He tried his luck at kayak fishing, while I tried to grab some pictures. We launched from the wonderfully handy Deep Fork River boat ramp on at the bridges on Highway 266 between Dewar and Grayson. 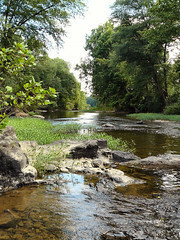 The water is deeper than most parts of the river, so you can paddle this portion of the river in the dryest of seasons. The high muddy banks provide good protection from the winter winds. There was little to no current running, we could sure use some rain around here. I brought paddling gloves, and an extra set of dry clothes just in case the weather changed unexpectedly. The scenery may look lame early in the day on Deep Fork, but as you near sundown the sunken trees start to take on a surreal look. 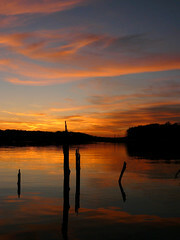 Don't leave your digital camera at home, winter provides some stunning sunsets that truly light up the Deep Fork River. Remeber to prepare for the water and the weather...cold kills and camera film gets brittle when the temps fall. That being said, flatwater paddling on Oklahoma lakes and low current rivers can really spice up your winter. 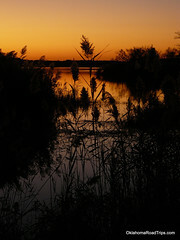 Got a local lake you like to savor the sunset on? Drop us a comment!